Performance:Compatible with Apple 2016(2015) New MacBook 12in. HP Pavilion x2 , DELL Venue Pro , Lenovo YOGA 900S , Chromebook Pixel, ASUS Gigabyte computer . Multi-function：HDMI 4K output, 2 x USB 3.0 ports and an SD TF card slot for simultaneous charging of the latest USB C laptop. Plug-n-play, Hot Swap,6 in 1. - Transfer data at speeds of up to 5 Gbps through USB 3.0 ports. That's fast enough to transfer a full HD movie in just seconds.When you want to read your TF SD card, it only takes a few secnds to complete the reading speed. Slim & compact： The compact and easy-to-use design makes it simple to take the Type-C USB Hub Does not require any software, drivers, or complicated installation process. Take you anywhere to be light and durable. 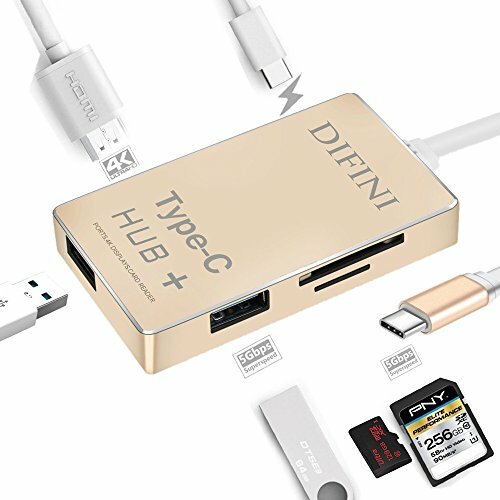 【Instant Expansion:】 USB Type-C charging port, HDMI 4K Port, 2 x USB 3.0 Ports, SD TF Memory Card Charging your laptop while connecting multiple peripherals and transferring data. 【Slim & Compact：】 The compact and easy-to-use design makes it simple to take the Type-C USB Hub Does not require any software, drivers, or complicated installation process. Take you anywhere to be light and durable. 【Lightning Read Speed：】When you want to read your TF SD card, it only takes a few secnds to complete the reading speed. 【Mac-Style Design:】Designed for new Type-C products, a new aluminum hub shell is used, ionized finish, reinforced TPE cable coating, EMI protection to prevent interfere with wireless devices. If you have any questions about this product by Difini, contact us by completing and submitting the form below. If you are looking for a specif part number, please include it with your message.